As promised forever ago, here's my Strawberry Cheesecake. I love making cheesecake - I started as part of a cheesecake contest with coworkers as a freshman at BYU and kept trying to perfect it. When our ward decided to have a dessert contest as part of our ward party, I thought it would give me a great reason to make my cheesecake - for the first time since the Bubbs was born! And so this is what I took with me - of course, by the time it was judged, half the strawberry juice had spilled on my pants and on the passenger seat of the car... I've got to work on the transporting problem. 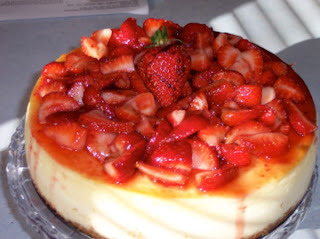 And how did my Strawberry Cheesecake rank? (drum roll.....) I was the 2nd Place Winner! I was satisfied with being the runner-up but my DH, of course, after sampling the winner (Blueberry something), insists I was robbed of my title :) Isn't loyalty nice? Truth is, it was really fun - I really enjoy cooking and baking and pretend I'm on the Food Network once in a while - it's one of those hobbies I can at least try to cultivate even with young kids.